As Wilson mounted the cart that was to take him to the scaffold, the headsman was seated before him, cloaked in black, his face covered, holding a large axe in his right hand and a knife in his left. “Did you ever see sic a crowd as this?” Wilson remarked casually to his executioner. At five minutes to three, he mounted the scaffold and several minutes later Wilson’s body was convulsing on the end of a rope, where it remained for half an hour, before being lowered and decapitated by the masked executioner, who held the bloody head aloft and proclaimed: “This is the head of a traitor.” The crowd jeered and shouts of “It is false, he has bled for his country!” were heard and reported in the Glasgow Herald the next morning. 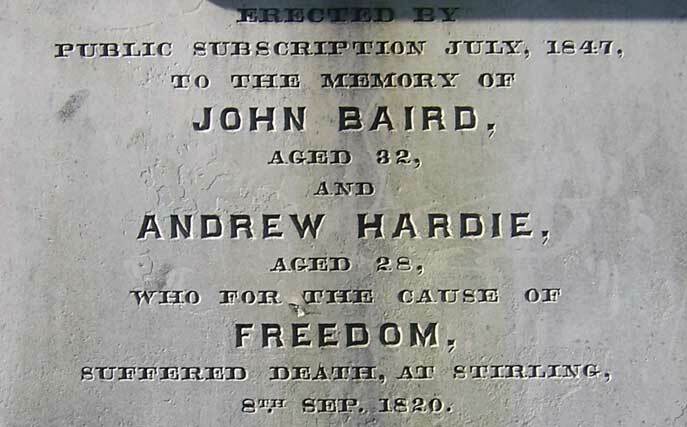 Barely a week later, on 8th September 1820, Andrew Hardie, a weaver from Glasgow, and John Baird, a weaver from Condorrat, met similar fates in Stirling: they were also hanged and beheaded. 19 others, mostly weavers, were sentenced to transportation, and already on their way to the colonies (mainly New South Wales in Australia); and that was the end of what became known as the Radical War, or the 1820 Rising. But, as Britain charged headlong into an age of immense industrialisation, it wasn’t to be the last time that the recently coined term ‘radical’ would serve as a prefix for a popular movement of workers demanding their ‘rights’ in society, and threatening revolution if their ‘rights’ were withheld. In Scotland, the Presbyterian Church, although often repressive in policing the moral fortitude of its flock, had passionately defended certain ‘rights’ amongst the ‘common people’ since the time of the Reformation – the first and foremost of these being the right the read the bible in one’s own language, without the interference of Latinate priests. Consequently, throughout the 18th century and into the early-19th century, Scotland had one of the highest levels of literacy anywhere in Europe, and indeed the world – a much higher rate than in neighbouring England, or even in revolutionary France. Beyond this peculiarly Scottish trend of literacy, it must be stated that the major influence on the 1820 Rising is the fact that those involved had lived in an age of revolution for over a generation. The American Revolution of 1776 had already struck a blow to kingship and its attendant system of feudal privileges. However, the French Revolution of 1789 was to send deeper shockwaves through British society. Here was proof for everyone to see that an ancient system of privileges could be toppled, that the common people could put themselves at the centre of power, and that republicanism was a viable option. However, although the French Revolution was an emblem of the possibility of change, radicals in Britain weren’t keen to openly associate themselves with the imperialist tendencies of Napoleonic France after Waterloo, and British radicalism was different in that it was peculiar to a Britain that was leading the world into the industrial age. The period following the American Revolution was a time in Scotland when groups calling themselves Friends of the People pushed gently for reform. These consisted of enlightened aristocrats, members of the rising middle classes, professional people, skilled artisans, and, especially in Scotland, literate, politically motivated workers. Also, the popularity of Corresponding Societies spread north from England, and helped to disseminate many reformist ideas. These ‘clubs’ were perceived to be perfectly respectable by most, and they epitomise the early spirit of the reformists, which often equated to moral and civic responsibility by ‘educated’ people in British society. However, the French Revolution changed all that for British radicalism, and as William Pitt the Younger led Britain into war with France in 1793, not only did the radicals become more vehement, but the propagation of these reformist ideas came to be viewed by the authorities as sedition, or even treason. In fact by 1795, following the public stoning of King George III’s carriage as it travelled to Westminster, parliament completely redrew the laws for treason, with the effect that holding public meetings in support of reform could lead to the stiffest penalties that the courts were at liberty to dispense. The ideological wrangling of the reformists would continue, although in a more low-key fashion during the war with France, but it was discontent at the real working conditions of people that would result in events like those which took place at St. Peter’s Fields in industrial Manchester in 1819, when a public reform meeting attracted hordes of the discontented. The authorities estimated the crowd at around 50,000-60,000, big enough to warrant dispersal by military force. A massacre followed in which 11 died and 400 were injured when the Yeomanry were ordered to charge. The massacre became known as Peterloo, a pun on Wellington’s defeat of Napoleon four years earlier. Peterloo sparked huge protests in Scotland, where the workers, and particularly the weavers, had much to complain about. The weavers in Scotland were skilled and literate people who traditionally worked to commission, chose their own hours, and managed their own lives in a way that was denied to many factory workers. Along with other skilled artisans, they formed an aristocracy of labour and were proud, independent, and increasingly radical in their outlook. In the first decade of the 19th century the average wage of a weaver halved, and the devaluation of their work continued in the second decade until the situation became unbearable for many. In 1813, a general strike of an estimated 40,000 weavers lasted over two months, until the authorities arrested the leaders, and unions grudgingly returned to work. As the post-Waterloo recession gripped Scotland, the situation worsened, with 1816 being a particularly black year for Glasgow, resulting in major bankruptcies across the city and its environs. This sparked another gathering of tens of thousands at Thrushgrove near Glasgow, demanding reform. By 1820, the reformists had a long tradition, locally, nationally and internationally; the economic situation only seemed to worsen, and the stage was set for the rising that would result in the deaths of Wilson, Hardie and Baird. There existed in Scotland a covert group called the Committee for Organising a Provisional government, which consisted of committed radicals, elected by their respective unions, who would assume responsibility of organising the new social structure of Scotland in the aftermath of a successful rising. However, it seems clear in retrospect that the committee had also been infiltrated by government spies, who were rife at the time, being one of the government’s most important defences against underground radical activities. The committee had the misfortune to convene in Marshall’s Tavern in Glasgow’s Gallowgate on March 21 1820, in the presence of a man who we can only assume was a spy – he was one John King, a weaver from Anderston. King left the meeting early, just before the entire committee was arrested and detained in secret by the authorities. The very next day, King was present at another meeting of important radicals in Anderston in Glasgow. It was also attended by another three men, who are now heavily suspected as being government spies: John Craig, a weaver, Duncan Turner, a tin-smith, and Robert Lees, described only as “the Englishman.” King took the initiative at this meeting and reported that a large-scale rising was imminent and that all those present should make themselves ready for armed conflict. The following day, on March 23, Duncan Turner unveiled plans for a provisional government and revealed a draft of a proclamation, inciting widespread revolt, that was to be posted around the city for the public’s attention. This proclamation is pivotal to the whole history of the rising, and, given that the real Committee for Establishing a Provisional Government was in jail, it seems likely that the proclamation was the work of government agents, and part of larger plan to sink the radical movement in Scotland once and for all. Although it is possible that the committee had managed to release the proclamation from prison, or had drafted it before their capture, the events that followed mounts the evidence against King and his associates, and all points in the direction of government treachery and entrapment. The following Monday, people from many different trades, but especially weaving, stopped work. They were not only refusing to work, but were in many cases preparing for war. Reports flooded in of groups of men engaged in military drills, and making weapons such as pikes from any material that could be obtained. Revolt was in the air. On Tuesday 4 April, Duncan Turner, the issuer of the proclamation, was mustering a group of about 60 men in Germiston, and using all his arts of persuasion to convince the men to march to the Carron Works in Falkirk, where they could obtain arms for the coming battles. Not all were convinced, but he rallied those that would go with promises of meeting more men on the way to help them in their mission. He himself would be engaged in organising other initiatives and wouldn’t accompany them on their long march. The leader of the group was the ill-fated Andrew Hardie, and Turner gave him half a card, which, he assured him, would match exactly with another half card held by a man waiting for him in Condorrat; a man at the head of another group of fighters. In this way the group would grow, swelling its ranks until it arrived at Carron. Waiting in Condorrat was John Baird, at the head of five men, holding his half card that had been given to him by none other than John King in one of his many guises. Both Hardie and Baird were no doubt expecting to unite with a small army when they matched their cards, and were obviously disappointed when they did match cards in the early hours of the morning. However, John King promised more support before they reached Carron, and he himself would ride ahead to rally these supporters. It is known that by this time the army already knew of a plot to take Carron, as a Lt. Hodgson had set off from Perth to protect Carron from an attack expected that day, Wednesday 5th April. Also, the band of radicals were spotted and reported twice following their departure from Condorrat, confirming for the authorities that trouble was afoot. The next time the band met King, they had been marching all night, and King told them to leave the road and wait at Bonnymuir while he mustered support from Camelon. This was the last the group were to see of King. Nor did they see more armed men rallying to their cause: instead they were shortly to meet opposing troops, with Lt Hodgson at their head, who had also left the road and incredibly found their way straight to Hardie and Baird’s band on Bonnymuir. The ensuing battle was nothing more than a skirmish, whereby Hodgson’s force of 32 soldiers, after a volley of shots from the radicals, easily overpowered them with a cavalry charge. Two soldiers and four radicals were wounded. In total, 19 of the radicals were taken prisoner and sent to Stirling Castle. The event in itself hardly constitutes a major rising, but other isolated disturbances were taking place across West and Central Scotland, and the journey of Hardie and Baird showed that at the fore of radical thinking was union with other groups in different parts of the country. However, the government seemed always to be one step ahead of the radicals, with inside knowledge at every step; also, the core organisers had been in jail since March 21st, without public knowledge, and some very suspicious men were acting on their behalf. The theory that the whole event was a plot hatched by agent provocateurs in order to draw the radicals into open battle is difficult to resist. By the time they neared East Kilbride, they were tipped off that an army ambush lay between them and their destination at Cathkin. Wilson returned to Strathaven, while his men avoided the ambush and reached their destination to find no action at all at Cathkin. By the following evening, the authorities had discovered the identity of 10 of the group, including Wilson, and held them under lock and key. Perhaps the worst violence occurred on Saturday 8th April when the authorities tried to move a group of the prisoners from Paisley to Greenock. The citizens of Greenock attacked the soldiers who had been ordered to move the prisoners. Even after they had completed their task, the soldiers still had to fight their way back out of the town as the crowd pelted them with stones. The army opened fire, killing eight people, including an eight-year-old child, and injuring 10 others. The government’s retribution was as harsh as the not-always-unsympathetic juries would allow; but examples had to be made, and they took the form of the executions of Wilson, Hardie and Baird. The rising was over, but the radical movement was only in an early stage of its evolution. Chartist or socialist banners later in the century and into the next. Along with the Peterloo incident, it marks an intensification of the desire and need for reform, and the martyrs, Wilson, Hardie and Baird, would serve as examples to those who feared that nothing could be done in the face of such as an increasingly powerful industrial state. James Wilson: "The Strathaven Martyr"
"I am glad to hear that my countrymen are resolved to act like men. We are seeking nothing but the rights of our forefathers - liberty is not worth having, if it is not worth fighting for. " James Wilson was a weaver, an artisan, an educated man. He died in 1820. Born in 1760, he lived during a period when the poor were without liberty or guarantees of life; when all expressions of desire for change and every aspiration towards democracy were ruthlessly crushed. Wilson has been a radical all his life. He has been prominent in the Friends of the People, set up in the 1790s to achieve political reform. After the Napoleonic Wars, there was an economic slump. The country was seething with rebellion. The government decided to act by flushing out leading radicals. Wilson was to be caught in their trap. 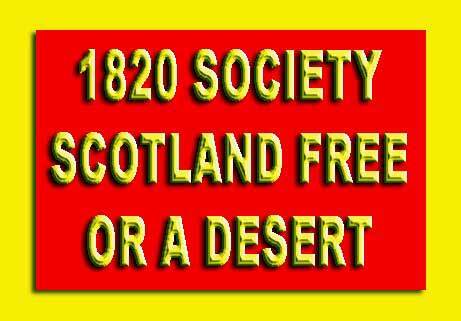 Induced by a belief that a radical army of 7,000 had assembled outside Glasgow, he led, in April 1820, a group of 23 armed men from Strathaven with a banner declaring: ‘Scotland Free or a Desert’. By the time he reached Kilbride he was informed of the true situation , and returned home. Arrested, he was tried for treason and executed in Glasgow on 30th August. At his trial Wilson, realising his fate was sealed, that he could obtain no justice from his condemners, appealed to posterity to do justice to his name, as a martyr "in glorious cause of liberty." Wilson is buried in Strathaven. A headstone, erected in 1990, marks his grave. A monument from 1846 also stands in his honour. John Baird was born on September 1, 1790. A weaver by trade, he was brought up in the village of Condorrat. Baird had a military career in the British Army, serving in the 2nd Battalion of the 95th Regiment of Foot (known as the Rifle Brigade) seeing military action in both Argentina and Spain. His military experience meant that he was suitable to become commander of the Radicals in their doomed march to the Carron Ironworks. 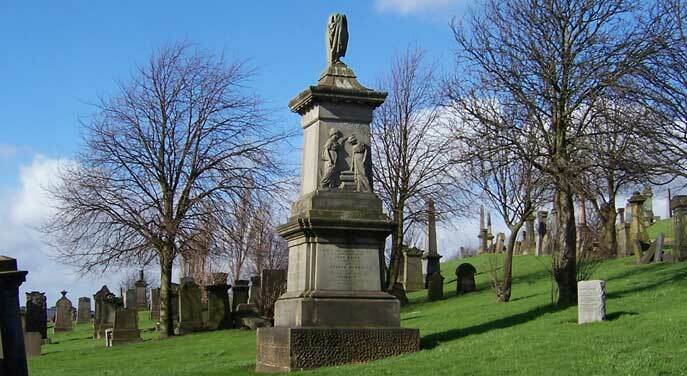 He was sentenced to death and was executed in Stirling on September 8, 1820 along with Hardie. After their unlawful execution their dismembered bodies were buried in a single grave outside Stirling Castle, where they remained for 27 years. 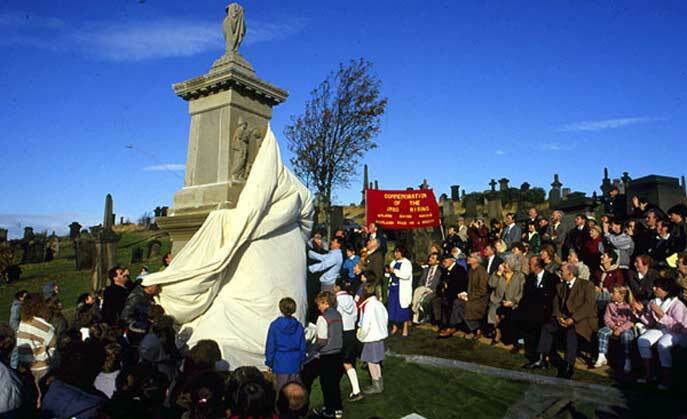 It was then decided by Glasgow Radicals to give them an honourable burial. 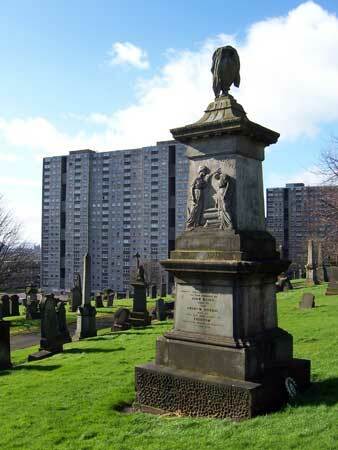 A party of Radicals travelled from Glasgow to Stirling to find the grave, but the grave was unmarked. However an old man named Thomas Chalmers, pointed out a particular spot claiming this to be the grave. After much doubt and considerable digging they came upon the bones of two bodies. The old man had been accurate in his pinpointing the spot as the bones could be identified by the smashed jawbone of Baird caused by the headsman missing his target first time. 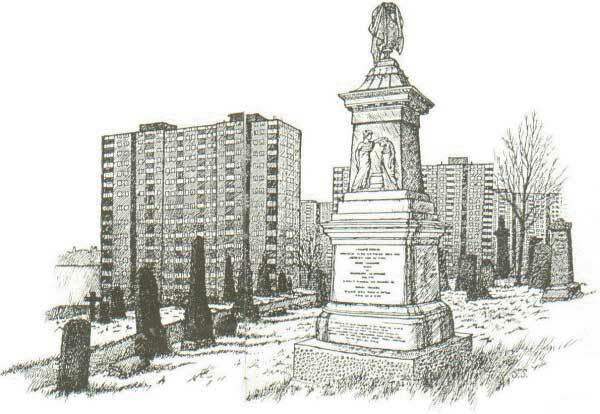 They were disinterred and reverently buried in Sighthill Cemetery in the north of Glasgow and an inscribed monument erected by public subscription. For More Info On The 1820 Risings See Below.